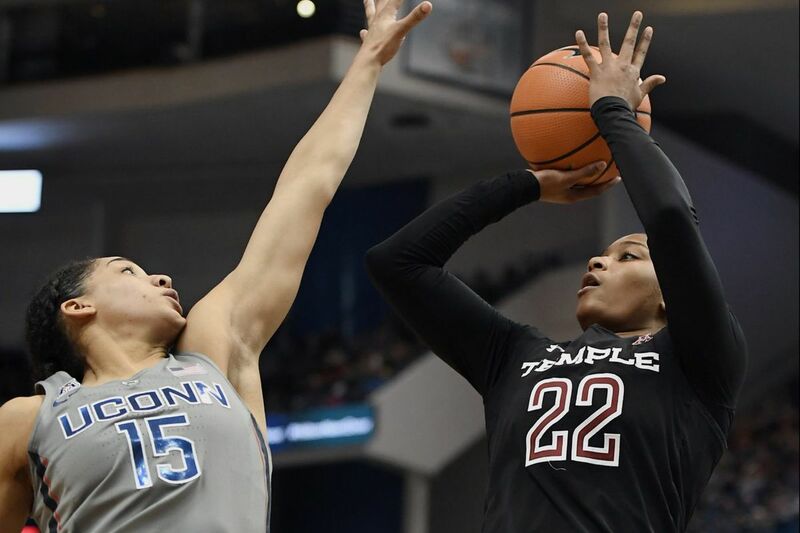 Temple’s Tanaya Atkinson recorded a double-double Wednesday and made program history in the process. Tanaya Atkinson recorded a double-double, but the Owls' offense struggled in an American Athletic Conference home loss to the Bearcats. Atkinson finished with 10 points and 11 rebounds, grabbing her 1,000th career rebound in the process. She joins Marilyn Stephens (1980-84) as the only two players in program history to have both 1,000 career points and rebounds. Emani Mayo led Temple in scoring with 13 points on 5-for-12 shooting. Desiree Oliver also went 5-for-12 from the field, adding 12 points. Mia Davis had 11 points on 4-for-15 shooting, going 3-for-4 at the free throw line. As a whole, the Owls' offense shot 33 percent from the field. Ana Owens and Shanice Johnson each scored a game-high 24 points for Cincinnati. Temple (10-17, 2-12 conference) has two games remaining before the start of the American Athletic Conference Championship. The Owls will travel to ECU on Saturday, then return home to face Memphis on Monday. Amy Griffin had 18 points and 10 rebounds for a double-double, but the Explorers fell short in an Atlantic 10 loss to the visiting Wildcats. Shalina Miller added 10 points, going 3-for-3 from the field and 4-for-4 at the free throw line. She also grabbed seven rebounds. Adreana Miller had 10 points as well, but on a rough 4-for-21 shooting. Katie Turner led Davidson with 18 points, and Mackenzie Latt added 16 points. La Salle (8-20, 3-12 conference) will face George Mason on the road Saturday. It will be the Explorers' last game before the start of the Atlantic 10 Championship.